This family includes only two genera, Barbourula and Bombina. Barbourula occurs in the Philippine Islands (Barbourula busuangensis) and Borneo (Barbourula kalimantanensis). The approximately eight species of Bombina are found in Europe, western Asia, China, Vietnam, and Korea. Bombina are warty, aquatic toads, and tend to be gregarious. The vocal behavior of some Bombina is unusual in that the call is produced during inhalation rather than exhalation as in other frogs. They lay pigmented eggs in ponds. The tadpoles have beaks, two upper and three lower rows of denticles, and a median spiracle (typical Orton Type 3). 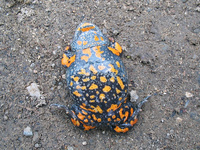 Species of Bombina have bright red or yellow mottling on the venter. The German word Unke means toad. Bombina exhibit an "unken reflex" when bothered. The animal will arch its back and limbs to expose the bright belly, and may turn over on its back. This acts as a warning to predators. Not surprisingly, the skin toxins of Bombina are distasteful. Barbourula are not as brightly colored but have webbed fingers in addition to webbed toes. Tadpoles of Barbourula are unknown. Both genera have flattened bodies. Fossil Bombina are known from the Pliocene to the Pleistocene; there are no fossils of Barbourula. Morphological synapomorphies of Bombinatoridae include an expanded flange of the quadratojugal and the presence of endochondral ossifications in the hyoid plate; these are the same as parahyoid bones, which are also present (Cannatella, 1985; Clarke, 1987). Yu et al. (2007) estimated the phylogeny of most of the species of Bombina using several mitochondial genes; they recovered a largely European clade (subgenus Bombina) and a largely Asian clade (subgenus Grobina). Prior to 1985, Bombina and Barbourula were generally placed in the Discoglossidae, with Alytes and Discoglossus, although the dissimilarity of Alytes and Discoglossus, on one hand, and Bombina on the other has often been noted (e.g., Lanza et al., 1976). Cannatella (1985) presented a phylogenetic analysis indicating Discoglossidae was paraphyletic. 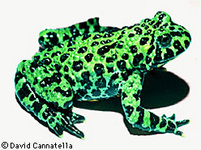 Ford and Cannatella (1993) formalized this by defining Bombinatoridae to be the node-based name for the most recent common ancestor of Bombina and Barbourula, and all its descendants. In contrast to Cannatella (1985), Hay et al. 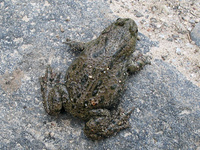 (1995) found Bombina orientalis and Discoglossus pictus to be closest relatives; this supports the monophyly of Discoglossidae in the traditional sense. Roelants and Bossuyt (2005) found a similar result, and continued recognition of Bombinatoridae and Discoglossidae. Griffiths (1963) stated that the diagnostic morphological feature of Discoglossidae sensu lato (including Bombinatoridae and Discoglossidae) is a triradiate sternum. This type of sternum is also present in Leiopelma. Clarke, B. T. 1987. A description of the skeletal morphology of Barbourula (Anura: Discoglossidae), with comments on its relationships. J. Nat. Hist. 21:879-891. Yu, G., J. Yang, M. Zhang, and D. Rao. 2007. Phylogenetic and systematic study of the genus Bombina (Amphibia: Anura: Bombinatoridae): new insights from molecular data. Journal of Herpetology 41(3):365-377. Page: Tree of Life Bombinatoridae. Bombinas and barbourulas. Authored by David Cannatella. The TEXT of this page is licensed under the Creative Commons Attribution License - Version 3.0. Note that images and other media featured on this page are each governed by their own license, and they may or may not be available for reuse. Click on an image or a media link to access the media data window, which provides the relevant licensing information. For the general terms and conditions of ToL material reuse and redistribution, please see the Tree of Life Copyright Policies.